24karat gold vermeil drop earrings by Herve Van Der Straeten. 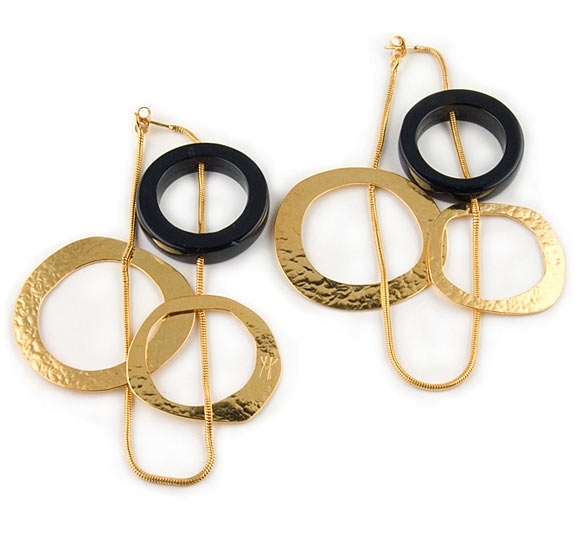 This stunning pair of earrings features a long snake chain with two gold circles and a 30mm black agate circle. Larger gold circle measures 39mm and smaller 30mm. Earrings measure 9.5cm (3.8"). in length and have a post back. A unique pair of designer earrings easy to wear all day and can be worn with or without the black agate given you two different looks. Also makes a wonderful gift idea.